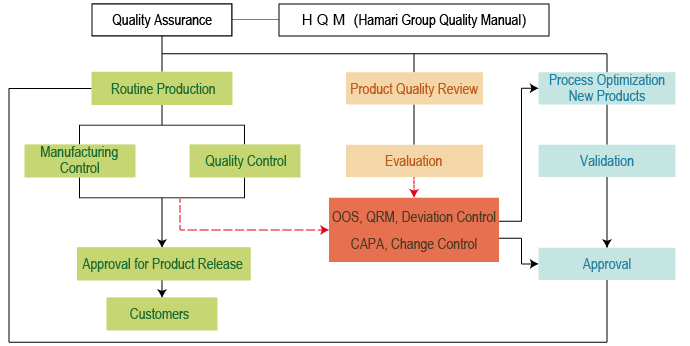 Quality Policy and Advanced Quality Assurance System | Hamari Chemicals, Ltd. In order to provide high quality products and services to our customers worldwide, we continually upgrade the skills of every single employee. Quality is the utmost importance, and a consistent efficiency in all activities is necessary. Hence, we have developed the following quality principles, which we, as a pharmaceutical company, not only follow but also integrate in our everyday life. In return, this benefits the company, the community, and society as a whole. We strive to respond to our customers in a sincere way while building trust and confidence that we maintain at the highest level of safety, reliablity, and quality at all time. We implement quality-related activites to maintain a stable supply of products while placing emphasis on preventive and corrective actions in order to further improve the overall level of quality. We are very conscious of the fact that all of our work – from development to delivery – is connected to the quality of the product. Through the implementation of continual and systematic education programs, we aim to enhance the knowledge of all employees in everything necessary for the product and for the requirements for Good Manufacturing Practice (GMP). We establishe a system to further improve the sharing of necessary information between employees, departments and customers and strive to implement a highly transparent quality assurance. We are aware of our social responsibility as a company that is part of the pharmaceutical and health industry and strictly comply with all domestic and international laws and regulations. We have a clear assessment of circumstances at all times, we will not allow complacency and we constantly strive to improve the quality assurance system. We developed our quality assurance system based on the Hamari Quality Manual (HQM) which is compliant with the Pharmaceutical Affairs Act of Japan and US-FDA requirements, and which incorporates the concepts of ICH Q10 (Pharmaceutical Quality System). These systems ensure our customers with the utmost quality.